How to synchronize with SFTP server. 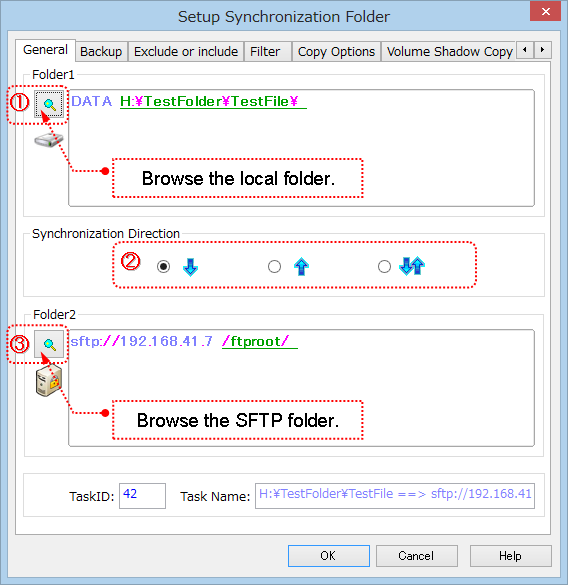 How to setup a task to synchronize with SFTP server folder. 3. Click to select the SFTP folder into the "Folder2" edit box. (1). Select "SFTP - SSH File Transfer Protocol" in the "File System" list. (2). Setup the parameters for connecting to the SFTP server. Server: The hostname of the SFTP server, like "sftp.server.com". Or the ip address, like "192.168.10.1". Port: The TCP/IP port, usually it is 22. NOTE: Please add this port to the exception list of the Windows Firewall and Anti-virus software, otherwise the port may be blocked. If the local computer is behind a firewall or NAT, usually the computer needs the proxy to connect to the SFTP server. If this option is checked at the first time, the "SFTP Proxy" global option dialog box will be popped up for setup up the settings of the SFTP proxy server. Click here for how to setup the SFTP advanced settings. (3). After set up the SFTP host name and account, press "Go" button to connect to the SFTP server, and list the folders in the SFTP server to the tree view. The log window below the treeview logs all the commands sent to the SFTP server, and responses from the SFTP server. 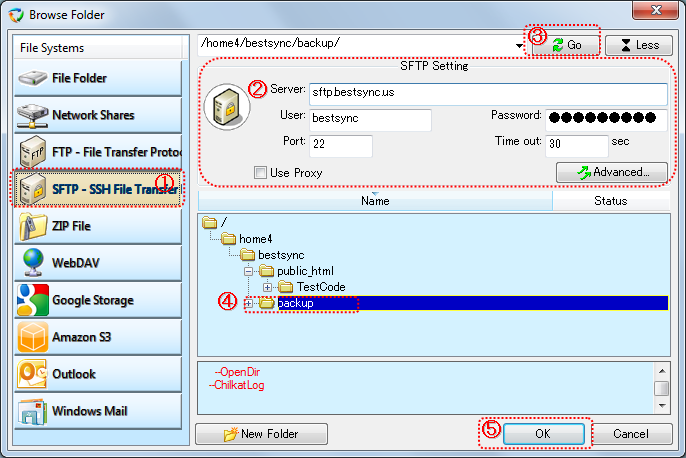 If the connection between BestSync and SFTP server can not be established successfully, please check the log.